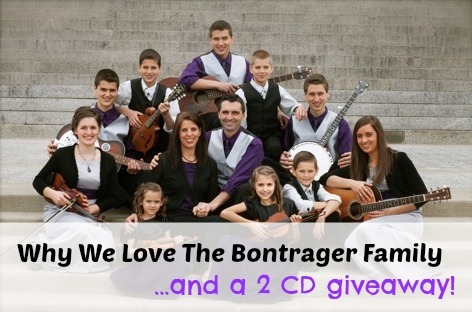 The Bontrager Family Singers - a 2 CD giveaway! On THURSDAY night I took Stephanie on a date to see the Bontrager Family Singers, a family of 12 that travels part of each year putting on performances at jails, churches, street missions, etc. The evening was full of musical talent and encouragement. We were encouraged through the songs and the skits. These included classic hymns and 20th century praise songs. A skit representing the cost of discipleship and martyrdom was included that I (Andrew) first heard on a Ray Boltz CD as a little boy. Each of the 12 members of the Bontrager family were obviously happy to be part of the performance. From the youngest (at 4 years old) with her own solo act, to each of the siblings and parents. There were loving smiles amongst the family members and towards the audience during and between the numbers. Some of our favourite acts were those where the parents expressed love to, or gave direction to one of their children in word or song. By profession, the family are dairy farmers, and I love the down-to-earth good-common-sense of farmers, having worked on a farm myself in the past. We purchased two CDs for ourselves, and decided we would give two more away here! We will be giving away a copy of "In God We Still Trust" and "We Have This Moment". (You can see the track lists here) That means two people will be selected each to win one CD. Simply enter the rafflecopter draw below! Oh! The Desires of my Heart! The awfulness of my sins, and the wonder that Christ would die to save me! The love for, and life-or-death urgency for souls on track for punishment. The sweet communion with other saints. Not only the urgent desire, but the satisfying pleasure of communing with the Father, Son, and Holy spirit in reading the Word and in prayer. And that I might not hear the Word only, and so deceive myself, but do what it says! Oh! That my son would feel the love that I have for him more! That I would more truly love him as our Heavenly Father loves his children! Oh that my wife would feel the tender love, compassion and understanding that Christ has for the church! Through me, a picture of Christ in this representation of Christ and the church that is our marriage! Oh! That Christ would show me my sin, and that through his strength I may give it the cut! That I would be ruthless with any sins that so easily ensnare and hold back! Oh! That I might always seek the strength of the Holy Spirit to love Christ more! To live for him more fully! Oh! that when I share the gospel, it might not be in word only, but also in power and in the Holy Spirit!